Click image to enlarge Coyote Wall, Bingen Gap basalts, Bingen, Washington. Washington State Highway 14 in the foreground. Image taken February 23, 2015. The Bingen Gap is an approximately four-mile constriction of the Columbia River located just upstream of Hood River, Oregon and Bingen, Washington. The gap is a large anticline/syncline feature of Columbia River Basalt through which the Columbia River carved its channel. 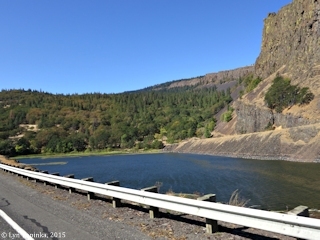 The Oregon side of the Bingen Gap stretches from the Oregon communities of Hood River upstream to Mosier and the Washington side stretches from approximately the community of Bingen to the Coyote Wall. The constriction of the Bingen Gap backed up the waters of the Missoula Floods. Flood waters approximately reached 950 feet at this point. Lewis and Clark passed through the Bingen Gap on October 29, 1805, and then again when they return on April 14, 1806. The U.S. Board of Geographic Names made the name "Bingen Gap" official in 1966, and states the Gap is four miles long by one mile wide. 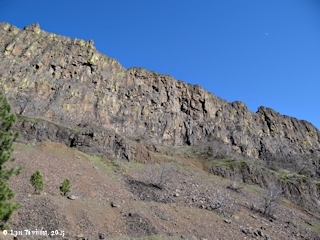 The Bingen Anticline is a highpoint in the anticline/syncline geological fold system in this area, and is bordered on the west by the Hood River - White Salmon River Syncline and on the east by the Mosier Syncline. The Bingen Gap is where the Columbia River carved a channel through the Bingen Anticline. 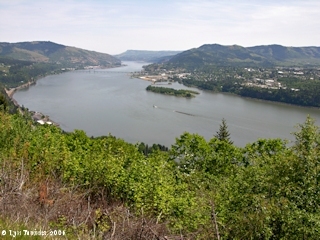 Click image to enlarge Columbia River looking upstream towards Hood River, Oregon. View from the Cook-Underwood Road, Washington. Image taken May 10, 2006. The Hood River - White Salmon River Syncline (valley) runs left-to-right through the middle of this image, with the Bingen Anticline (ridge) rising behind it. The Bingen Gap is where the Columbia River carved its channel through the Bingen Anticline. The Rowena basalts can be seen in the distance through the Bingen Gap. In this image the White Salmon River is at the middle left edge of the image. 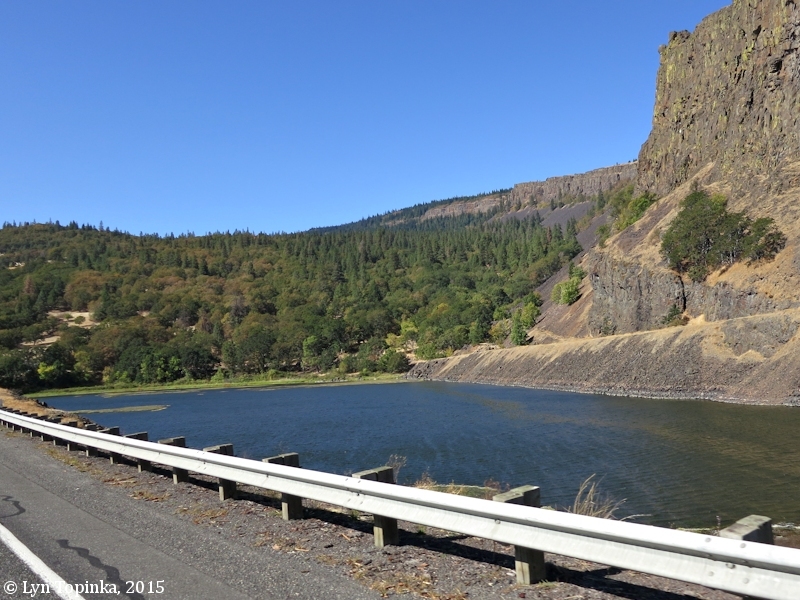 Click image to enlarge Bingen Anticline, as seen from Mosier, Oregon. Image taken September 18, 2005. On the Washington State side of the Bingen Gap is the "Coyote Wall", a steep massive basalt cliff, rising to 1,800 feet. 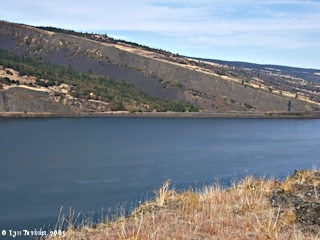 At the toe of the Coyote Wall is a small cape known as "Straight Point" and is located at Columbia River Mile (RM) 175. Straight Point is where the Coyote Wall meets the Columbia River. Nestled in on the west side of Coyote Wall and Straight Point is Locke Lake. Click image to enlarge Coyote Wall, Bingen Gap basalts, Bingen, Washington. Image taken February 23, 2015. Click image to enlarge Locke Lake as seen from Washington State Route 14. View from moving car heading west. Image taken September 26, 2015.